Hello dear friends. It is Saturday and I hope you enjoy beautiful weather and good company. Let’s talk today about symbols that became really modern. Have you noticed how for some period of time there are some things that become really popular and are used everywhere – on T-shirts, on bags, on mugs, in frames. I remember how trendy were.. owls once, then ribbons, even pugs fashion at one point – those illustrations with cute pug and caption: “Pugs no Drugs” :). Now I’ve noticed recently a new trend with… butterflies. 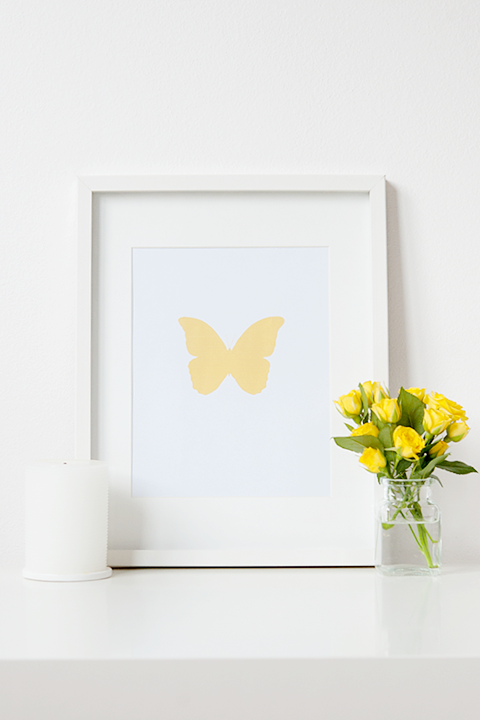 I love butterflies and I decided to be in line with the fashion too – so I created for myself a frame with a yellow butterfly and because I like you a lot, a really really lot :) I made the butterfly in a way so you can use it too if you like it. Just download the file , print it, put it in a frame and that’s it. :) I made few different butterflies – in yellow, black, pink, pale blue and of course in the color for 2011 according to Pantone (PANTONE 18-2120 Honeysuckle). I hope that you like the idea and at least one will fit in your home :). Remember, the weekend is for resting, so enjoy it! Привет. Днес е събота и се надявам, че се наслаждавате на хубаво време и приятна компания. Хайде днес да си говорим за символите, които стават модерни. Забелязвали ли сте как за известно време някой неща са наистина популярни и се използват навсякъде – на фланелки, по чантите, по чаши и в рамки. Аз си спомням такава вълна от използване на сови, панделки, дори имаше и мопсо мания – онези симпатични илюстрации с надпис “Pugs no Drugs”. Надявам се, че не сте забравили, че уикенда е за почивка, така че му се насладете напълно :). 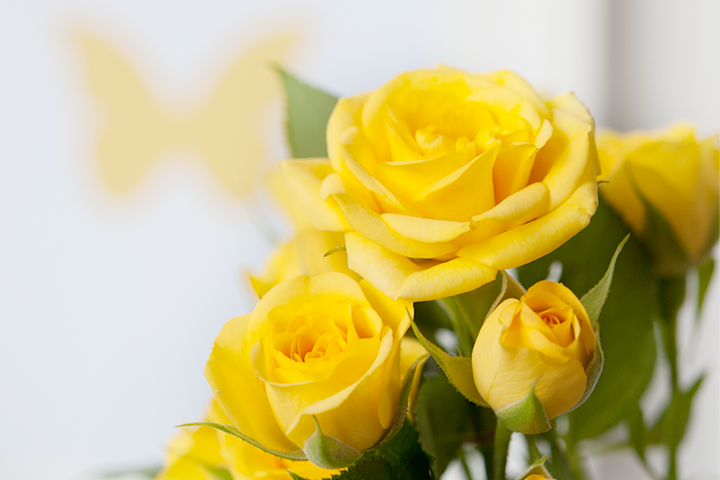 I have also yellow roses in my last post! 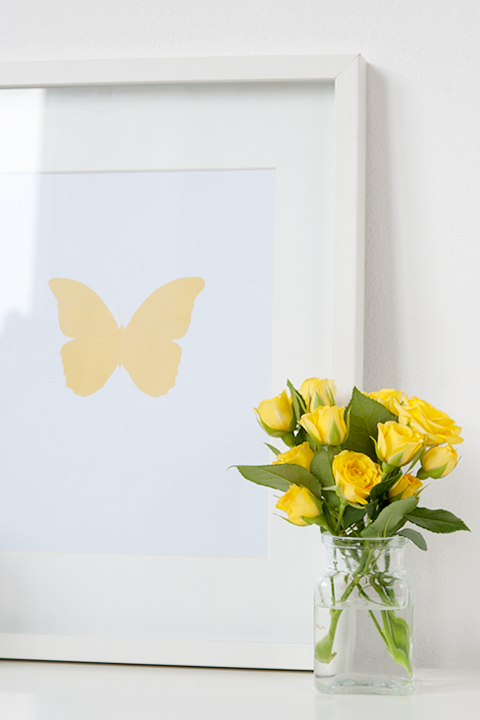 o yes , I like it :) It's better than old ugly trend to keep in frames dead dried butterflies or other insects! Thank you Radostina, just the thing I needed. I have a triptych picture frame that I was trying to figure out what to do with. Now, it'll feature the butterflies in light blue, pink and honeysuckle. How perfect! I'll let you know when it's ready with hopes you'll approve of it. They are lovely! Thank you! Have a nice Sunday. this is so true..I have seen so meany butterfly t shirts lately! Love yellow sooooo much too! Това е много подходящ подарък за близък човек! Hi! My name is Vale, I come from Argentina, but currently I am living in Germany. I love your website! Thanks for the files, I´ve already made my own frame. Your are kindly invited to come and see how it looks like. Love these, so simple but really pretty.